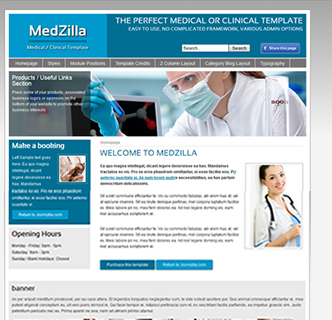 Welcome to Joomzilla, your number 1 stop for professional Joomla templates. We offer a range of professionally built Joomla templates that work well for your business, sports club or organisation. 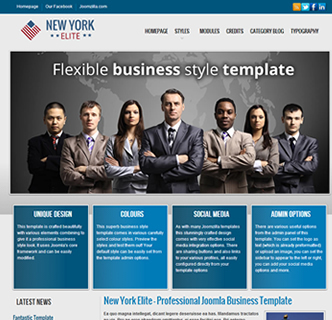 All of our newer range of Joomla templates use the Bootstrap framework and are 100% responsive. We offer our premium Joomla templates at the best price. 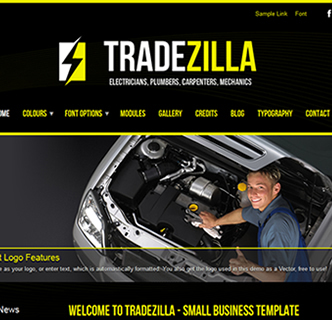 Tradezilla is a beautiful dark themed Joomla template for electricians, plumbers, mechanics and all other tradesmen. It's minimal yet stunning design works great for all small business's, with its large centered logo and excellent feature positioning. The stylish logo you see with this template comes free, and in vector format, allowing you to use it or modify it as you wish. You can even use it on your client projects or as a logo for a business. This template is an easy to use yet beautiful design, with slideshow and also a photo gallery included. There is no need to install additional extensions as there are social media links and sharing options included within the template. 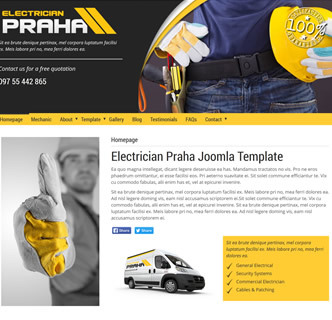 For any small business such as a mechanic, electrician, plumber, builder or carpenter this template works great, its easy to use, comes with tons of options and is minimal in design. You can have it setup in record time and with the different background options it will impress all your visitors. 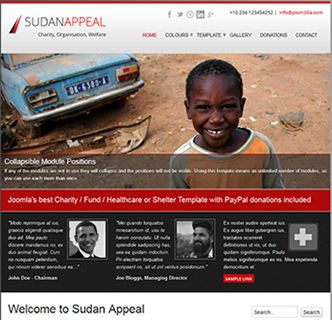 Joomla's best template for charity's, shelters, aid agency's and more is here, welcome to Sudan Appeal. This template works great for all types of refuges, animal welfare organisations and charity's, with its main benefit being the donations integration. This allows you to easily accept payments into your PayPal fund, and those making the donations don't even need a paypal account...super! A well as a strong emphasis on a professional Joomla template that comes with various colour options this template has an effective "Donate Now" button visible at the top corner of the template. This can be enabled or removed directly from the template manager, and allows you to link to your donations page. The template is responsive, uses Twitter's bootstrap and looks great on mobile devices and tablets. There are additional modules added in just for adding images with a hover effect, great for sponsors or links to other sites and there is also an additional main menu position in case you need more room for your menu items. 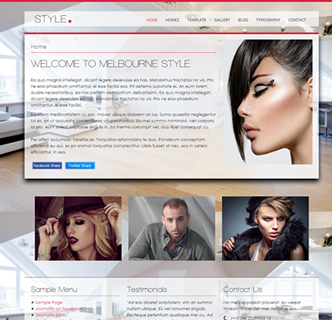 The benefits of this fantastic Joomla template, our first of 2014 are endless. Use your imagination and see how this template can be adapted to suit business needs and be sure to test out the various options and pages by sampling the demo. 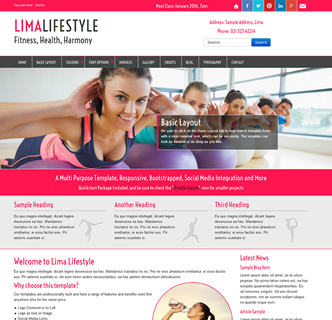 Lima Lifestyle, a versatile & responsive template for Fitness & Health that can be adapted to suit multiple purposes. This template comes with many features that allow you to change the appearance directly from the template manager. For customization this is a template that works great and has many uses. Be sure to view the "Basic Layout" of this template so you can see just how much you can adapt this stunning Joomla theme with just a few clicks such as changing the colour, remove the header section and more. There are 10 carefully selected colour styles to choose from and also options for setting the main body font style. There are both social media sharing buttons included and links to your social media profiles, no need to install any additional extensions. If you want to see how this fitness website template adapts for mobile phones, tablets and other devices test it by resizing your browser or visiting on your cellphone. Visit the photo gallery to give you an idea how you could get a nice collection of images on display on your website. Look at the excellent amount of collapsible module positions and also be sure to view the styling and options available to you in the typography. 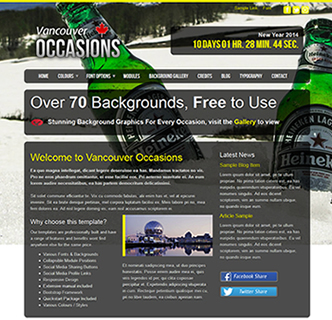 Vancouver Occasions is a fantastic Joomla template that works for all occasions, seasons and events. We named the template after a very seasonal city that offers events throughout the day. Where else can you surf, ski and visit a Chinatown in one day! We scoured the internet at Joomzilla to bring you the very best images available, and these come packaged with the template and available as a background image! There are dozens to choose from, swimming, sports, business, abstract, christmas and more. You can view the backgrounds on offer by clicking on the "Background Gallery" page on the demo website. There is a fantastic countdown time on the homepage which further strengthens the templates offerings, use this template to promote an exhibition, to showcase a promotion or upcoming event or as a simple holding page which effective background image. All the main module positions are collapsible and its a responsive design, meaning you can see how the template adapts on mobile devices, tablets and other media formats by testing out the demo. 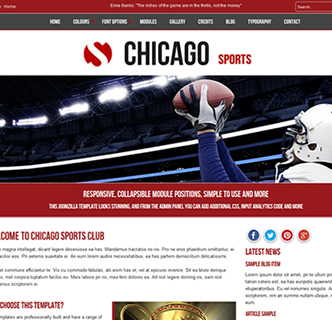 A Joomla template for all you sports fans, Chicago Sports Club. As a city proud of its sporting achievements we named this responsive bootstrap Joomla template after the city, and with its simple yet effective style you can build a superior website for your sporting organisation with ease and multiple options! 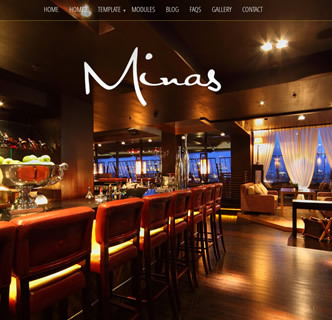 This template comes with a photo gallery, superb slideshow, and the usual easy to use Joomzilla layout. There are various social media aspects to this theme, as you can add social media links directly from the template manager, also you can add social media sharing buttons with the click of an option. The template comes with 3 different pre-packaged fonts, and a very useful motivational or quote section at the top of the page. This can be used to display the latest news or links to various page. If you are looking for a Joomla template for your football club, baseball club, basketball club or other type of club be sure to test this template out. It also works great for other purposes as its very customizable and can be adapted to suit your business needs or other interests.